Part One: Introduction - What are eyepieces for? Telescopes don't work without an appropriate eyepiece with which to view with, and this immediately makes the eyepiece a very important part of the construction of the telescope, in fact, it is the other half of a very finely tuned optical system that has been developed over hundreds of years. However, advances in technology over the past 150 years has set the scene for a number of choices that may be made by the amateur astronomer, based on the construction and the quality of the optics themselves. But what are these choices, and how can the ordinary person in the street (in this case a person new to amateur astronomy) decide on what eyepiece to buy and what performance it is likely to yield? But I had some eyepieces with my new telescope! It is perhaps a travesty to learn that with your first telescope that you may have spent two or three hundred pounds for came with eyepieces that are barely fit for purpose, and even the well established manufacturers provide only the most basic specification eyepieces with which to start. This is such a shame as many a budding amateur astronomer may be put off at the very first hurdle because the quality of the image is both poor and lacks the expected clarity that buying a worthy telescope called for in the first place. There are probably two reasons for this, one is that the making of Optical Tube Assemblies (OTA's) i.e. the telescope itself, is relatively cheap by comparison and the quality of a scope is found here in the first instance, and not in the eyepieces themselves. The second is that the manufacturer may want to elicit future sales by getting you to buy the various eyepieces and any extras at a future date. Of course, the manufacturer will argue that this gives the consumer more choice. However, this is not good practice for those setting out on this great new adventure in my view. So what can you expect with a new telescope? You will most likely get at least two eyepieces, these are usually of a 25mm and 10mm focal length, one for viewing wide sky (25mm) such as star clusters and galaxies, and one for viewing the Moon and the planets (10mm) and gives you, with greater maginification the detail needed to say, view craters on the Moon. However, some manufacturers will only supply the 25mm with your new scope, and it is certain that you will soon get bored with this limited choice. Of the most popular telescope manufacturers, Sky Watcher perhaps supplies the better 'starter' eyepieces with their Super Wide 25mm & 10mm eyepieces, some telescopes (Meade in particular) come with a set of five MA (Modified Acromat) eyepieces and this is really good for the beginner, and many people swear by this first set of eyepieces. Celestron on the other hand tend to supply eyepieces which unfortunately leave a lot to be desired. The eyepieces often come with the following identifing features: SR4 , H12, K20. The letters refer to the eyepiece construction and are often uncoated, which means they may suffer from reflection and chromatic abberation (false colour). Therefore the message here is to avoid eyepieces that start with these initial letters as they are not particularly good, and you should consider replacing them as soon as possible. Notes on what to upgrade to are given below. 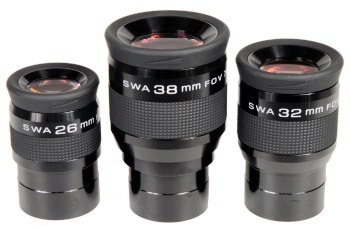 good 3-element starter eyepieces, they are often dispatched as part of a boxed set of five eyepieces. Not all starter eyepieces are of the best quality, it is therefore best to always seek advice when thinking about upgrading eyepieces. Eyepieces are a really important part of the telescope - the other half of what is in effect a finely tuned scientific optical instrument, so if the eyepieces are not also of a fine standard your enjoyment will be affected. When thinking about upgrading seek the advice of others, or get advice from the specialist shop you bought your new telescope from (rather than a high street store). Better still, join an astronomy group and talk to others, and view through their telescopes to get a better understanding of what different eyepieces have to offer. - The most popular telescope eyepiece barrel diameter is 1¼ inches (31.75 mm). Most scopes have these. - Telescope eyepieces with 2 inch (50.8 mm) barrels are also available, but you must check whether your telescope will accept this larger size diameter before considering these. If your telescope has a good sized aperture (such as reflectors of 6" mirror or above) there is good chance that it may accept 1¼" and 2" diameter eyepieces. Many good quality refractors will also accept these, however SCT's and Maks very rarely unless at the high end of the market. What difference does it make whether you use a 1¼" or 2" eyepiece? Viewing a celestial object through a 1¼" or 2" eyepiece of similar quality (say an 8mm) will look exactly the same if used in the same scope where the focal length of the scope remains constant. - at low power 2" eyepieces (25mm to 38mm focal lengths) are good for deep sky observing and not so good for planetary and lunar observing. - 2" eyepieces may not perform so well with SCT's or Maks because of the telescopes' long focal length, making the wider field of view that the eyepiece offers irrelevent. - one of the biggest disadvanges of the 2" eyepiece is their cost, with decent eyepieces in this diameter regularly starting at around £80, more than twice the cost of a decent 1¼" eyepiece! The other thing is that filters for 2" eyepieces will also cost twice as much and so on. - 2" eyepieces tend to be heavy and may easily tip a lightweight telescope. 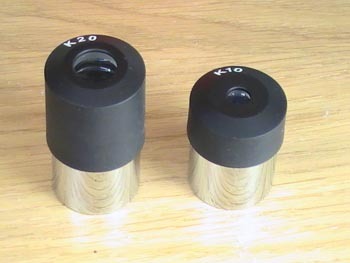 If you would like to use 2" eyepieces with your 1¼" diameter focuser there is nothing to stop you doing so, all you need to do is buy a 1¼" to 2" convertor, which costs around £20. Bear in mind that 2" eyepieces have disadvantages as well as advantages when used with scopes and tripods not built for the purpose. One: They are heavy and might tip the balance of a lighter scope. Two: They are at least twice the price of 1¼" eyepieces, along with their associated filters! Three: You will not obtain the best field of view (FOV) that the eyepiece offers if you are limited by the 1¼" width of your focuser. Three: Eye relief is usually better (x2 normally) and so more comfortable. Some eyepieces come with 2" and 1¼" fitting and give great benefits to the 1¼" user, the most prominent of these are the Baader Hyperion range of modular eyepieces - highly recommended at around £85 each. They also work well with Barlow lenses. Eyepieces consist of several elements, 'elements' refers to the glass portion of the eyepiece, so if an eyepiece has four elements this means that it is made up of four peices of glass within which creates the maginification and the focal length of the eyepiece. Some of these 'elements' are cemented together and so a doublet means two pieces of glass cemented together and so on. Such a construction often consists of a singlet followed by a doublet or more. One of the most popular eyepieces, the Plössl, consists of a minimum of two doublets, for example, and may not have a singlet eye lens, although they are getting increasingly sophisticated! Most modern eyepieces are coated which helps reduce reflection and false colour. Generally speaking, the more elements that an eyepiece has, the better its performance should be, providing that it is made well and originates with a good manuafacturer. Eye relief refers to the closness to the eyepiece that the human eye needs to be in order to see the object being viewed, this is often called 'exit pupil'. The best measure of this is to remember that eye-lashes are appoximately 5mm in length, so this gives you a good idea of how to measure an eyepiece's performance in relation to what you feel comfortable with. Eye relief is of particular concern to spectacle wearers and in this instance the better eye relief an eyepiece offers, the better for spectacle wearers. However, eye relief is of interest to all astronomers because good eye relief = comfort. The problem is that high power eyepieces do not often give good eye relief, because greater magnification = smaller field of view, and this in itself requires you to be viewing at a much closer range for the pupil to engage the object being viewed, so eye relief of 2mm-5mm is about the best you will get (remembering the eye-lashes are approximately 5mm in length). However, in eyepieces of greater focal length (6.4mm and above) there is a certain amount of choice that can be made by the amateur astronomer when reviewing the eyepieces that can be chosen. Various eyepieces by their construction give varying degrees of eye relief, this is often related to field of view (FOV) as for example, if an eyepiece has a narrower field of view then inevitably the eye relief will not be as great. Consequently when reviewing eye relief you must also consider the field of view. Hot Tip: Eyepieces with good eye relief often suffer from blacking out or 'kidney-beaning'. This happens when the eye is viewing inside the eye relief zone (too close), view slightly further away so that your eye is at least at the reported distance for eye relief, it means being a little bit patient, but this is one of the problems with eyepieces with good eye relief, you have to view at just the right distance or 'exit pupil' - see '3' in the above diagram. Many quality eyepieces with good eye relief have twist-up eyecups, these are invaluable for setting the distance for the eye relief that is required for the viewing conditions, BST Explorers are a prime example. Field of view is the apparent area of the sky that is available to see using an eyepiece, rather than the actual field of view, which in reality is a very small part of the sky usually. As a general rule of thumb 50º FOV and above is considered to be good. However, when considering eyepieces this is not the only factor, because for example, many astronomers consider a good quality orthoscoipic eyepiece to be a good investment, yet they traditionally only have 40-45º FOV. This is because in this particular instance the orthoscopic eyepiece is very good for planetary and Moon studies where a narrower FOV is of some benefit (especially in SCT's). The disadvantage of a 40-45º FOV is that the object you are viewing, if it is a planet, soon goes out of your field of view and if you have a telescope without any motor, it can be quite a challenge to keep the object centralised. If you have a manual scope and it is a reflector, always ensure that it has been accurately polar aligned, that way you will only have to adjust the scope on one axis with slight turns of the slow motion control. If you have an alt-azimuth mount then following the object as the Earth's axis turns will prove more difficult. High and Low Power, Eye Relief and Field of View are all related to one another, the higher the power you use, the less eye relief you get, and as you move from low to high power your field of view reduces by a proportionate amount. When considering what eyepieces are best for you, it is important to consider what objects you want to view, as high power eyepieces are better for planetary and lunar viewing and low power are better for star clusters and galaxies. Most amateur astronomers will have a selection of both high and low power eyepieces, and some of these will consist of different designs according to their own particular interest. Generally speaking, the better the eye relief for a given eyepiece, the more comfortable it becomes to observe the night sky. There are eleven or twelve types of designs in eyepieces, and you can find out more about these at Wikipedia. Here is a short summary of the most popular eyepieces listed and described by Wikipedia, along with a glimpse of the higher end of the market. Carl Kellner designed this first modern achromatic eyepiece in 1849, also called an "achromatized Ramsden". Kellner eyepieces are a 3-lens design. An achromatic doublet is used to correct the residual transverse chromatic aberration. 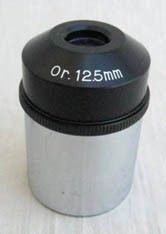 Illustrated opposite is a Celestron 25mm Kellner eyepiece, note designation KE, however, many Kellner eyepieces have the single designation of 'K'. Used on the the correct aperture scope these eyepices are simple in construction and can give good images, aperture f/6 or f/8 is better. The standard modified "acromat" 3-element eyepiece is similar to the Kellner and has a FOV - 52° or better. The Modified Achromatic design has an optical advantage over the Kellner and is often used in entry-level telescopes. 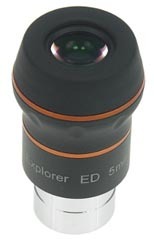 The eyepieces, sometimes marked 'MA' or similar generally have good all-round performance and good eye relief, but lack the sharp contrasty images of 4 and 5 element designs. Price range: £10 - £15 each. A boxed set of 5 from Meade will cost about £72. The 4-element orthographic eyepiece was invented by Ernst Abbe in 1880. It is called "orthoscopic" or "orthographic" because of its low degree of distortion. It is sometimes called an "ortho" or "Abbe". The orthoscopic design uses a convex-convex triplet field lens and a convex-flat singlet eye lens. Orthos have nearly perfect image quality and good eye relief, but by modern standards a narrow apparent field of view - about 40°-45°. Until the advent of multicoatings and the popularity of the Plössl, orthoscopics were the most popular design for telescope eyepieces. Even today these eyepieces are considered good eyepieces for planetary and lunar viewing. The König eyepiece was designed in 1915 by German optician Albert König (1871-1946). The original design is a simplified Abbe, with a leading doublet instead of a triplet. The original design allows for high magnification with remarkably high eye relief - the highest eye relief proportional to focal length of any design before the Nagler, in 1979. The field of view of about 55° makes its performance similar to the Plössl, with the advantage of requiring one less lens. Modern versions of Königs can use improved glass, or add more lenses, grouped into various combinations doublets and singlets. The most typical adaptation is to add a positive, concave-convex simple lens before the doublet, with the concave face towards the light source and the convex surface facing the doublet. Modern improvements typically have fields of view of 60°-70° Good for lunar studies. The Plössl was originally designed by Georg Simon Plössl in 1860, and several versions can be found on the amateur astronomy market. By far the Plössl eyepiece is currently the most widely used design. The name Plössl eyepiece covers a range of eyepieces with at least four optical elements. Usually consisting of two sets of doublets (a doublet lens is a convex and concave element sandwiched together). Since the two doublets can be identical this design is sometimes called a symmetrical eyepiece. 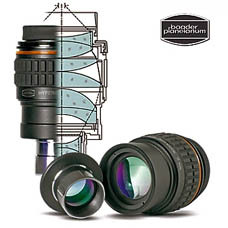 The compound Plössl lens provides a large apparent field of view along with relatively large FOV. This makes this lens ideal for a variety of observational purposes including deep sky and planetary viewing. The chief disadvantage of the Plössl optical design is short eye relief, which is restricted to about 70-80% of focal length. The short eye relief is more critical in short focal lengths, when viewing can become uncomfortable. Up to eight optical elements in 4 or 5 groups. 70º FOV to 100º FOV. Multi element eyepieces can by expensive but if you have ever had an opportunity to look through such a fine eyepiece then you will realise the huge advantage that these can give both in relation to field of view and in the quality of the image. TeleVue 'Nagler' and 'Ethos' eyepieces are the most expensive on the market and can easily cost more than the telescope itself, with some prices as high as £600 or £700! Price range: £75 - £105 each. Sky Watcher's new 2 PanaView 5-element eyepieces with their impressive high-contrast super-wide views are ideal for low power, deep-sky observing. Available in focal lengths of 26mm, 32mm & 38mm, with apparent fields of view of 70° and eye relief of 20mm, 24mm & 28mm respectively. NB. You will only ever need one of these in your collection so choose well, I find the 32mm more than adequate, with the 38mm being far too heavy and cumbersome, it is massive! The 32mm or the 26mm will give you the satisfying magnification you need for low power observing and star-hopping. This means that if you had say a 24mm and an 8mm, these would Barlow down to a 12mm and a 4mm, which gives a very satisfying viewing range, as well as fantastic eye relief. NB. the 24mm cannot be modified by the FTR's, but all others in the series can. The Hyperion is a comfortable eyepiece with a large field of view that is easily visible even with eyeglasses. A field of view of 68 degrees is regarded as ideal for astronomical observations and is the largest field of view that can be viewed without strain and without turning your eyes. There are 11 or 12 different designs of eyepieces, however, some earlier designs have now fallen out of use because of the advent of advanced technology and the improved multi-coatings used to disperse false colour and to give sharper fields of view. Improvements such as multi-element eyepieces improve the quality of the image considerably and a field of view (FOV) of 50º and above is considered good. Various designs in eyepieces offer different qualities of FOV and eye relief, and some eyepieces work better with faster telescopes whilst others work better in long focal length telescopes (or apertures) such as SCT's (Schmidt Cassegrain Telescope). 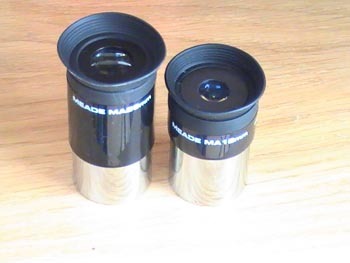 Generally speaking, wide angle eyepieces with low magnification work better in faster scopes (f/5) whilst high magnification for planetary use work better in focal lengths f/6 and above. However, owners of fast scopes will have a range of good high magnification eyepieces in their armoury, but will choose eyepieces with good eye relief and multiple elements as a preference to aid comfortable viewing. Part Four: Now that I know all about eyepieces, where do I start? Assuming that your telescope came with one or two eyepieces (a 25mm and a 10mm), the first thing is to buy a 2x Barlow Lens, this doubles the maginification of the eyepieces you already have, so your 25mm becomes a 12.5mm and your 10mm becomes a 5mm. The next thing you should do is buy a Moon Filter so that you can explore the Moon for long periods at a time. It is recommended here that you should buy a ND96 (0.9 or 0.6) Moon filter (The 0.9 and 0.6 by the way refers to the density, the higher the number, the more density. A low density for use with smaller aperture telescopes and a higher density for large apertures, suggest 0.09 for large apertures above 6" and 0.06 for small apertures below 6" - light transmission 13% and 25% respectively), the ND means Neutral Density and therefore optics do not add any false colourization, whereas some Moon filters have a colour bias (usually green). A Barlow lens will cost between £18 & £28, and an ND96 (0.9 or 0.06) filter about £15. If you want to stop here then this is the least you need to do to expand your enjoyment of the sky at night. There are good Plössls and not so good. The best advice is to stick to branded Plössls, such as Celestron, Sky Watcher, Meade, Williams Optics, Orion or Baader Planetarium and so on. In most cases amateur astronomers will want to start with the most affordable designs that gives the best value for money, and in my book there is no finer design than the four-element Celestron Plössl eyepiece. Individually these cost between £14 and £30, and in my mind are the sharpest, clearest eyepieces both for wide sky (the 32mm) and for Lunar and planetary work (6mm etc). They also suit fast scopes around f/5 but are even better on f/6 and above, along with SCT's. The following focal lengths are recommended: 32mm; 15mm; 9mm; 6mm - note how when you Barlow these there is no duplication of sizes, so Barlowed, these would give you a range of 8 focal lengths! However, if you have a limited budget then I would recommend the 32mm and the 9mm to start. These would Barlow down to 16mm and 4.5mm, a perfectly satisfying range for most types of viewing. The illustration opposite shows the very fine Celestron 32mm Plössl, very much recommended. Sky-Watcher and the Meade 4000 Series Plössl's also offer very good value for money but are a little more expensive than the Celestron, but good clear views. The Meade 5000 Series are even better! Hot Tip: Where you are aware that eye relief is not of a premium (such as in the higher magnifications of the Celestron Plössls, for example), Barlow a lower power eyepiece instead, that way you get the higher magnification as well as better eye relief! So if you want 15mm maginifcation for example but better eye relief, Barlow the 32mm to give you 16mm instead! If good eye relief and sharper images are of premium, and you want to upgrade to a finer eyepiece then the Meade 5000 Series HD-60 eyepieces offer great veiwing potential. The latest advancement in the Meade Series 5000 eyepiece series offers a large 60° apparent field of view and a flat field of view which is tack sharp right to the edge. This design provides more than 17mm of eye relief for terrific viewing comfort while simultaneously delivering a 40% improvement in corrections for chromatic aberration and edge distortions over traditional Plössls. Features a precision manufactured 1.25" barrel, increased eye relief and an adjustable twist-up rubber eyeguard for comfort and blocking stray light. Focal lengths available: 4.5mm, 6.5mm, 9mm, 12mm, 18mm, 25mm. The eyepieces are parfocal with the exception of the 18mm and 25mm models. Orthoscopic eyepieces are rather more specialist than the Plössl and are really designed for planetary viewing and long focal length telescopes, though they can be used effectively in reflectors of shorter apertures, but try them out first. 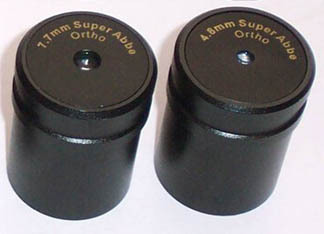 'Orthos' as they are called used to be the more popular eyepieces some years ago before improved multicoatings arrived and the popularity of the Plössls. Because of its narrower FOV - 40°-50° they do not compare quite as well to the Plössl, and because of the narrower FOV their focal lengths would normally range from 2.5mm to no greater than 18mm, as they are not to be considered for wide field (deep-sky) astronomy. Orthos can be of mixed quality so talk to other people about them before committing to a purchase. The following are illustrations of some current orthos on the market, they have varying degrees of quality but obviously the reputation and quality of the Baader Genuine Ortho is undisputable, but if you want to try a cheaper one which will give perfectly good results in an f/6 telescope (or greater), then the Kson is well worth a try at around £25. This eyepiece has proved very popular with amatuer astronomers, and at a price from around £49, it is unbeatable for performance as a middle of the range eyepiece. The eyepiece uses two separate ED (Extra-low Dispersion) glass elements of different glass types in its optical system to provide exceptional colour fidelity (with astonishingly low levels of chromatic aberration) so that the true colour differences between binary star pairs and planetary surface details are easily visible. It has a 60° field of view which is very flat and it is particularly recommended with telescopes with a f/5, or greater, focal ratio. It is uniformly sharp edge-to-edge, with markedly low astigmatism. Barrel distortion is essentially non-existent, eliminating the annoying "goldfish bowl" effect of distortion of the image which is often seen in some eyepieces when panning across a star field. Each air-to-glass surface in the Explorer eyepiece is fully multicoated for high light transmission and exceptional contrast. This high contrast makes it a good choice for splitting close binary stars, for examining low contrast lunar and planetary detail, and for finding small and faint planetary nebulae against a truly dark sky background. The lens edges are blackened to eliminate internal reflections and further improve contrast. As you would expect, the chrome barrel is threaded for standard 1.25" filters and has a capture ring to help reduce the chances of accidently dropping the eyepiece out of the focuser. Explorer eyepieces are parfocal, minimizing the amount of refocusing needed when changing eyepieces within the series.The eyepiece is set in a heavy rubber cladding which is grooved for easy grip. It has a soft rubber twist up eyecup which will make it unbelievably convenient to those of us who wear spectacles. The colour coded body rings and clear lettering print will help you find the right one in the dark. The eye lens is large in diameter (see photo) and with 13mm eye relief this makes it very comfortable and easy to look through. There are a number of different types of eyepieces on the market. But generally speaking the improved multi-coated Plössls are currently the best eyepieces for both planetary and lunar use, as well as deep sky (the 32mm being the best for deep sky). Stick to branded eyepieces such as Celestron, Meade, Sky Watcher, Baader, Williams Optics, Orion, and of course TeleVue and Pentax if money is no object! 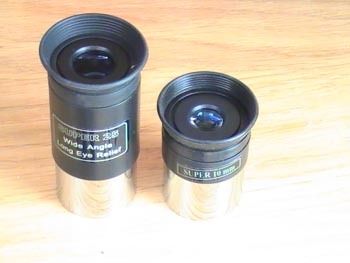 Do not buy eyepieces with identifying features that you do not understand, and avoid the following types that begin with letters such as SR (Symmetric Ramsden), H (Huygens) or K (Kellner). These are basically starter eyepieces. Multiple element eyepieces (5 elements and above) should give you better and sharper views, as well as better eye relief. Remember that these will inevitably cost you more, but quality of viewing is key to the enjoyment of astronomy. 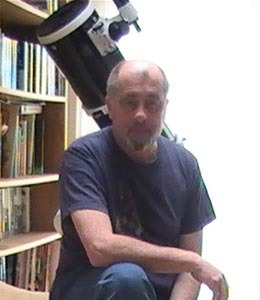 Robin Wilkey is Communications Officer and Website Designer for Swindon Stargazers. He has always been interested in the night sky, an interest he shares with his wife Hilary. A couple of years ago he extended their interest when he bought his wife Hilary a telescope for Christmas. Since then both Robin and Hilary have been keen amateur astronomers and they have acquired a further telescope with which to explore the heavens. Eyepieces are a really important part of astronomy as the eyepieces you choose will affect your enjoyment of the hobby. Eyepieces do not have to be expensive, but choosing the right one is important, so I hope this guide, from personal experience, will be helpful.